Ever since Wonder Woman became the first big female super hero in 1942, super heroines from Batwoman to the Fantastic Four’s Invisible Girl have been a force to be reckoned with. This month Grande Vegas Casino salutes the super women of our time with a Facebook Contest and Super Bonus Weekend. The Super Heroines Leaderboard Contests continue and there will be two more Super Heroines Live Raffles with $250 instant prizes this month. A contest on the Grande Vegas Facebook Page this week gives players a chance to vote for their favorite super heroine and possibly win a $100 no-deposit bonus. A Super-Bonus Weekend wraps up the Super Heroine Month with five fantastic bonuses totaling an incredible $1,000 available on the last weekend of May. Since the beginning of the month, the Super Heroines leaderboard contest has been awarding prizes up to a total of $10,000. 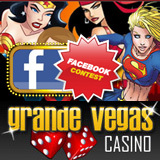 Contest details and players’ current standings are available at http://www.grandevegascasino.com/superheroines.aspx. Weekly raffles have been surprising players with instant prizes of up to $250. The next live raffles will be held between 11am and 1pm EST on May 23rd and 30th. Grande Vegas, popular with online casino players around the world, features Las Vegas favorites like Blackjack and Roulette and dozens of amazing slots games including the brand new slot game Loch Ness Loot and several, such as Jackpot Piñatas, with million dollar jackpots.